Fit for the red carpet, these emerald and diamond earrings are mounted in a unique, handmade setting of 18K yellow gold and platinum. One earring features a 4.57 ct flawless (no oil) square shaped emerald, while the other features a 5.02 ct internally flawless H color asscher cut diamond. Both are surrounded by VS2-SI2 fancy yellow diamond halos, 0.82cts. Dangling from each center are three pear shaped drops and the center drop is suspended by an additional VS1-VS2 F-G round diamond for additional drama, 0.24ct. Hanging from the emerald earring are two pear shaped diamonds and one pear shaped emerald. 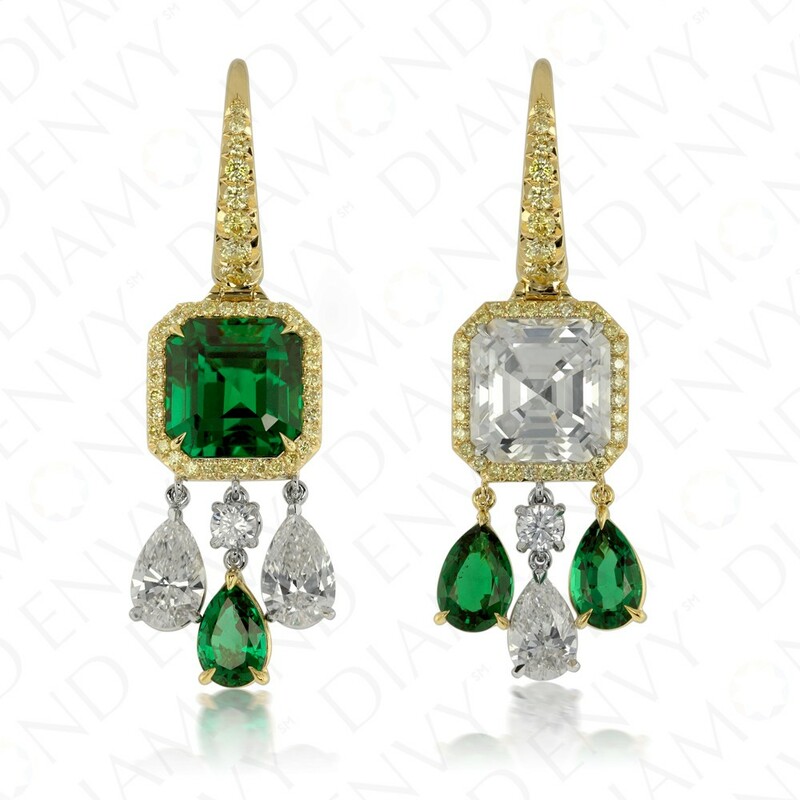 Hanging from the diamond earring are two pear shaped emeralds and one pear shaped diamond. Fancy intense yellow diamonds of graduated sizes also accent the custom french wire design. Pear shaped diamond drops: 2.05ct H-IF color. Pear shaped emerald drops: 2.19ct.